It’s an interesting production “The Linden Tree” at the Pentameters Theatre, Hampstead, London, ongoing until the next 5th of June. The piece was written in 1947 by the celebrated English author J. B. Priestley a renowned playwright, novelist, free-thinking broadcaster and left-wing activist. This production particularly tends to recreate the 1940’s atmosphere including crew and staff wearing English post- war style clothes. The cosy Pentameters Theatre is sensible too. Located in a Victorian building, above The Horseshoe pub, it was founded in 1968 by Leonie Scott-Matthews, who is also the show producer. “The Linden Tree” analyses the changing world immediately after the Second World War. Priestley allows his characters to debate key issues, especially religion versus science. The late 1940’s were a hard moment for the UK with shortage of coal and petrol and war-time rationing still ongoing. Besides, England had to face the end of the Empire and a declining position in the world. Additionally, the nuclear threat was not posing optimistic views for the future. Therefore, the problematic question here asked is: should one fight on in the name of progress, or put personal happiness first? The Linden family lived many years in the provincial city of Burmanley. They have gathered for Professor Linden 65th birthday celebration. He is “the trunk of the Linden tree”, the mother is the roots and the rest of the members are the leaves. teenager student. Professor Linden (Chris Bearne) faces the bitterly reality of his age: the University doesn’t want him anymore. Mrs. Linden as well wants to go away from the city she always disliked. 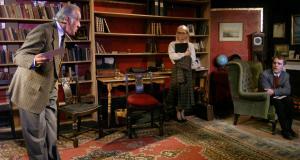 Professor Linden is unaware of the situation and takes two students Edith Westmore (Marusiya Kalinina) and Bernard Fawcett (Graham Dron). while Dinah would remain with the father helping the housemaid, Mrs. Cotton (Anna Friend), in the house. Directed by Michael Friend the show is a well conceived performance. Actors play good in difficult roles that require a long effort. black jacket. At times the authorial voice can leave the plot far behind, slowing the action and extending the length time to almost three hours.